where D is the density, m is the mass, and V is the volume. We're leaving out the effects of temperature and pressure for this simple explanation. If an object is less dense than water it will float in water. If it is denser than water it will sink in water. Density Simulation from PhET, University of Colorado, Boulder. 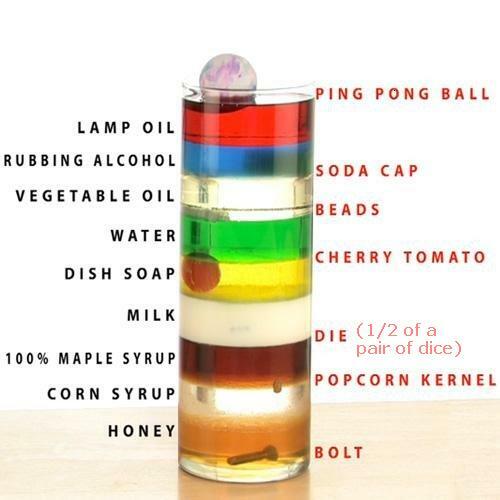 Interactive, quickly shows the concept of density using objects of different mass like ice cube, brick, etc. Some float, some sink. One of many such simulations from PhET. 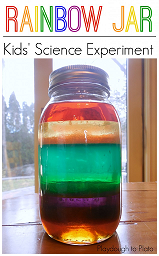 Rainbow Jar A Kids' Science Experiment. Written by a National Board-certified Kindergarten teacher. For pre-K and K-1 learners. Teaches the concept of density. Use common household ingredients to make a rainbow jar. Article includes the materials list, recipe, photos, and lesson plan.